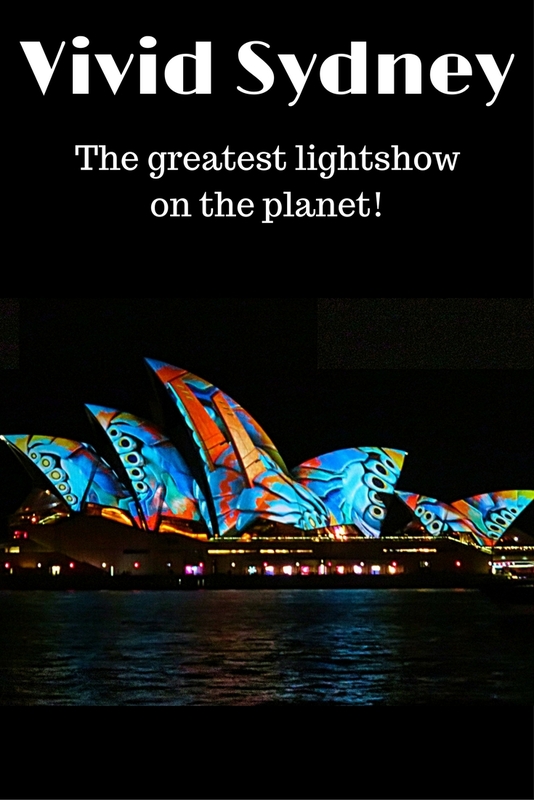 The Travelling Lindfields: Vivid Sydney: The world's best festival of light. 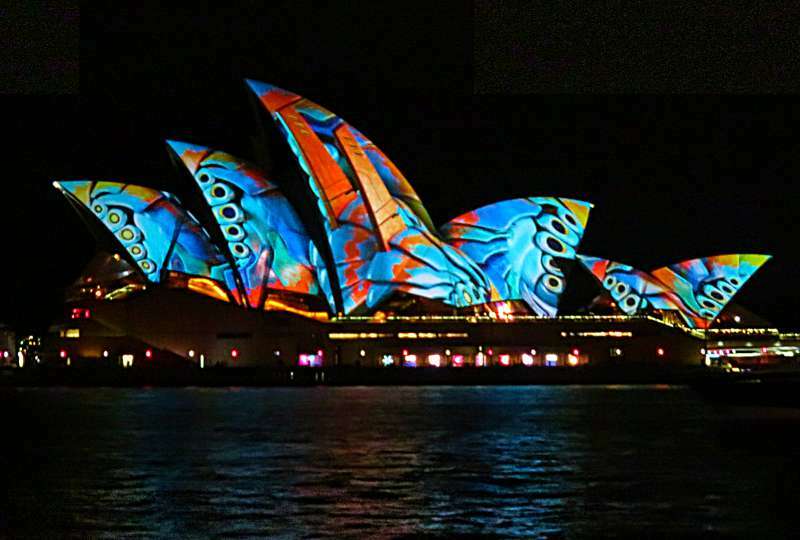 Vivid Sydney: The world's best festival of light. 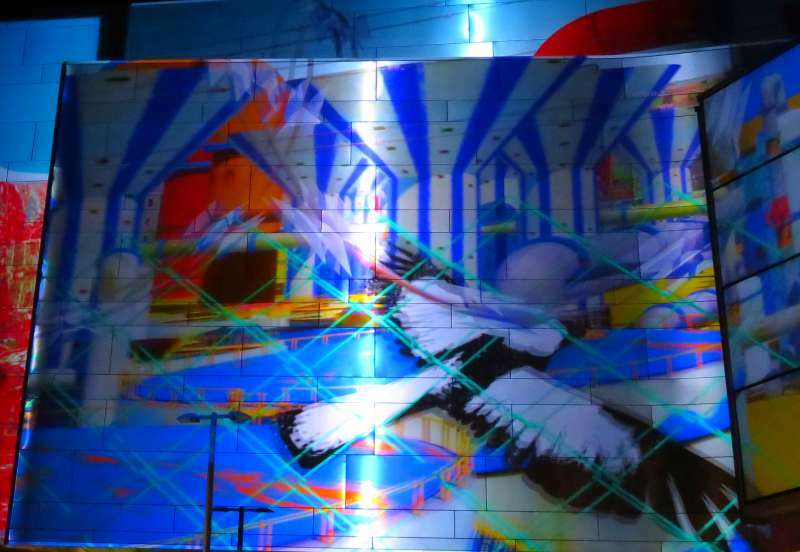 Billed as the world's largest outdoor 'art-gallery' Vivid Sydney never disappoints. 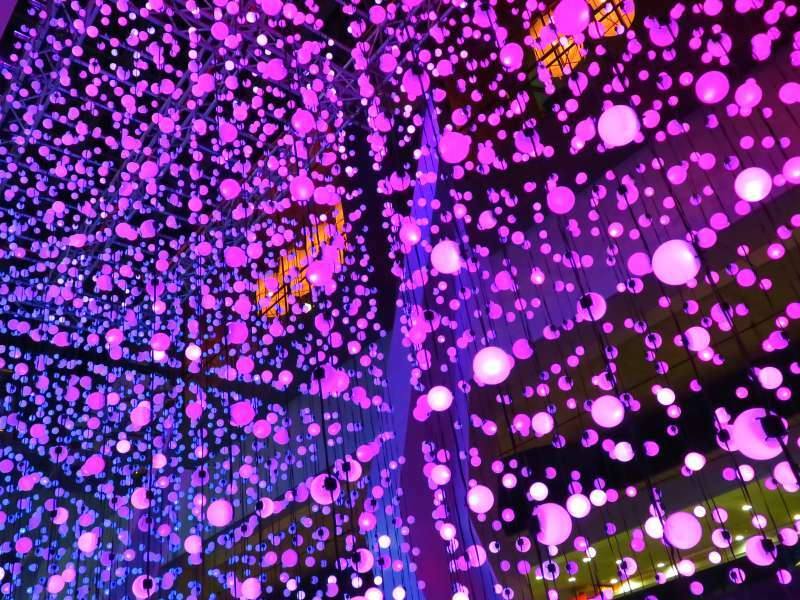 Vivid is a festival of light which draws tourists from around the world. 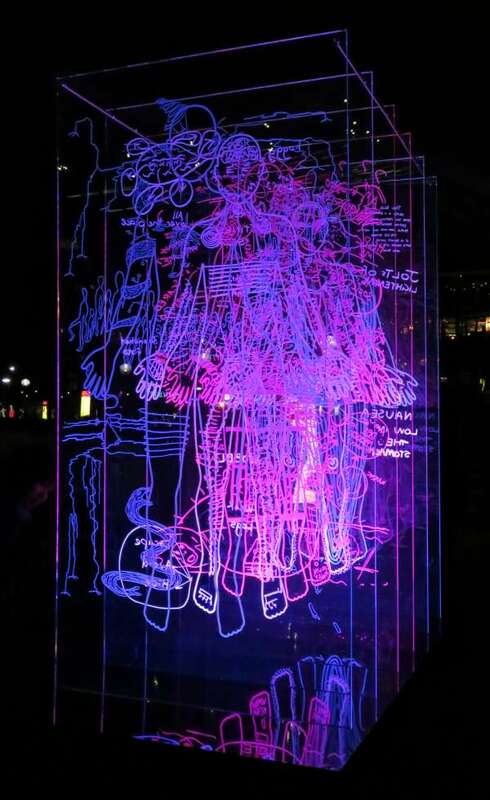 With famous landmarks like the Opera House and Sydney Harbour Bridge bathed in ever changing light patterns, Vivid draws us into town year after year. If you live too far away to make it to Vivid this year, plan a trip for next year because Vivid just gets better and better! I got so many great photos of the Opera House it was hard to choose which ones to post. The Harbour Bridge was a little bit disappointing this year but everything else was so fantastic it didn't matter. I couldn't resist putting this video in. It is the display on Cadman's Cottage at The Rocks. 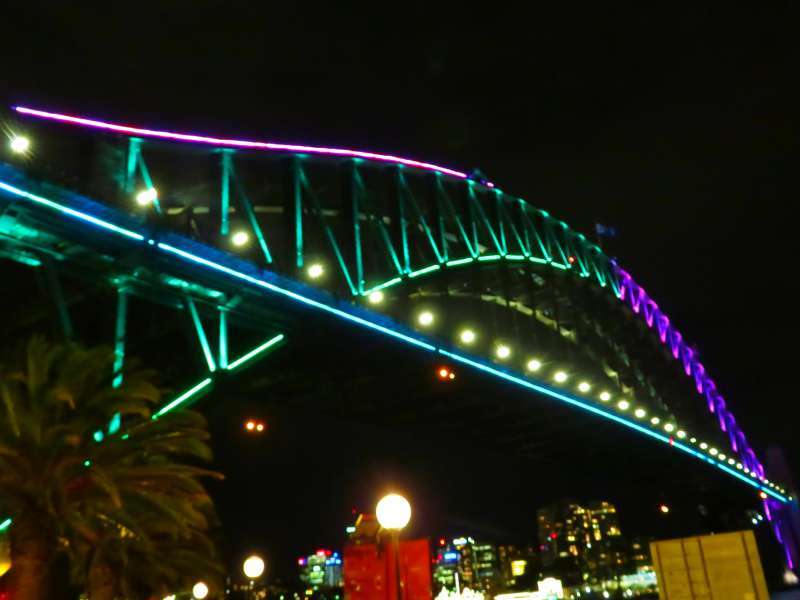 Vivid doesn't just light up the city. There are displays at Chatswood, Taronga Zoo, Darling Harbour and Kings Cross. For a full list of locations click - here. David and I live quite close to Chatswood so we headed down there this year to catch the local display. It was a lot of fun but I wouldn't bother travelling across town to see it. The main display area on The Concourse is visible from several restaurants which is handy. Where - Sydney Australia. Vivid is not confined to the CBD. In 2017 reaches as far afield as Chatswood, in Sydney's north. For where to see Vivid go to Vivid Sydney: Precincts. When - 26 May to 17 June 2017. Cost - There are paid events, (none of which I have ever been to) but seeing the lights is absolutely free. The best place so see the Vivid lights on the Opera House is from the opposite side of Circular Quay, between Hickson Road Reserve and the Overseas Passenger Terminal. There are a couple of harbourside restaurants here with great views. Do not miss the display on Cadman's Cottage at the Rocks facing the western side of Circular Quay. It is lots of fun, especially if you have children with you. The Magicians of the Mist show in Darling Harbour runs for about 10 minutes from the hour and half hour beginning at 6 pm. It is spectacular. There are boat tours which do Vivid Cruises and I am sure they are fantastic for seeing the Harbour Bridge, the Opera House and all the buildings around Circular Quay, but don't just rely on a cruise because many of the best displays are not visible from the harbour. There is no substitute for arming yourself with a map and just walking around. 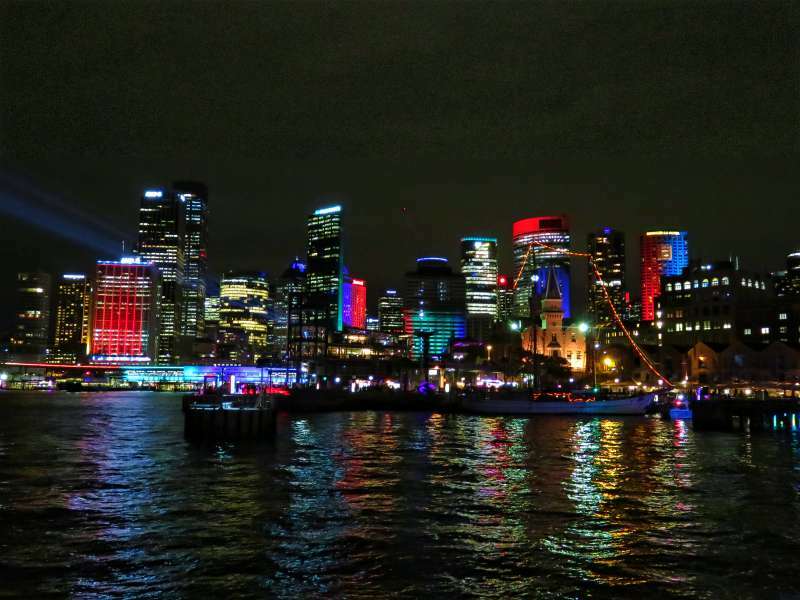 If you want to see Vivid from the harbour but don't want to do a tour, catch an inner harbour ferry. The F4 and F5 ferries to Darling Harbour and Neutral Bay go past the Opera House. You can get off at Kirribilli or Milsons Point and walk or take a train back across the Harbour Bridge. 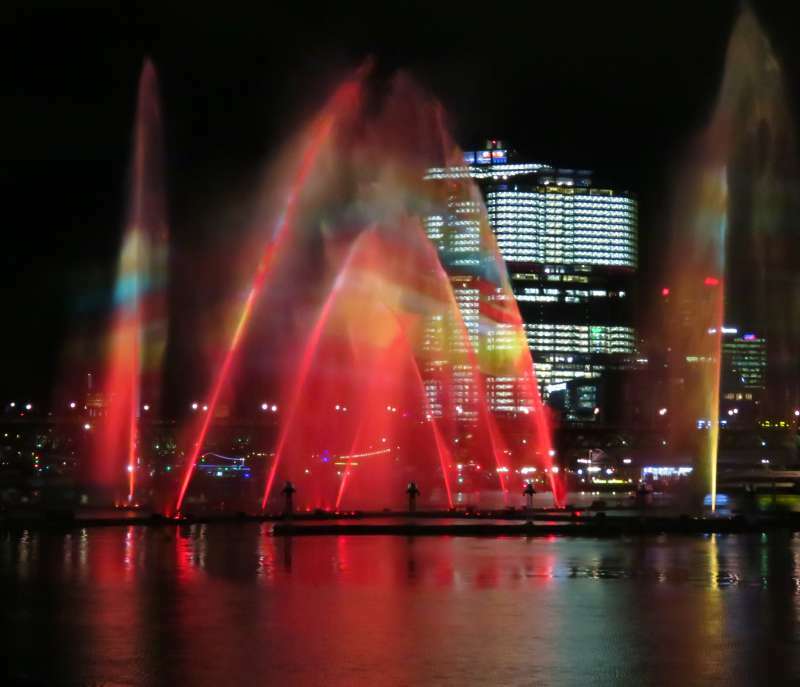 Darling Harbour is also one of the Vivid Precincts. It is a short walk back to town and you can plan your route to take in the Vivid Sights at Barangaroo. Wear a warm coat, and comfortable shoes. May/June in Sydney can be a bit chilly at night and you will do a fair bit of walking if you want to see everything. Vivid can get very crowded so avoid weekends if you can. 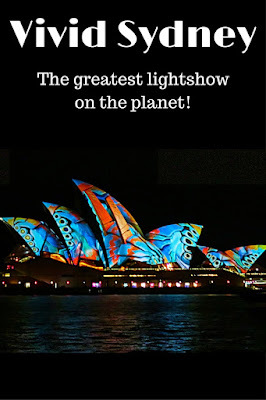 For Vivid photos from earlier years check out my post at:- Vivid Sydney: A festival of light you shouldn't miss! For other Sydney posts click here. You and I are circling each other at the moment! ;) Lovely pics! Yes. We must have been in Chatswood almost at the same time. I love Vivid. If I wasn't so absolutely flat out right now I would go again and see all the bits I missed. Wow it seems like every year Vivid just gets better and better. We went in 2014 and absolutely loved it travelling around on the ferry from spot to spot and ending in Darling Harbour where our hotel was. We must get back there to see in person again. 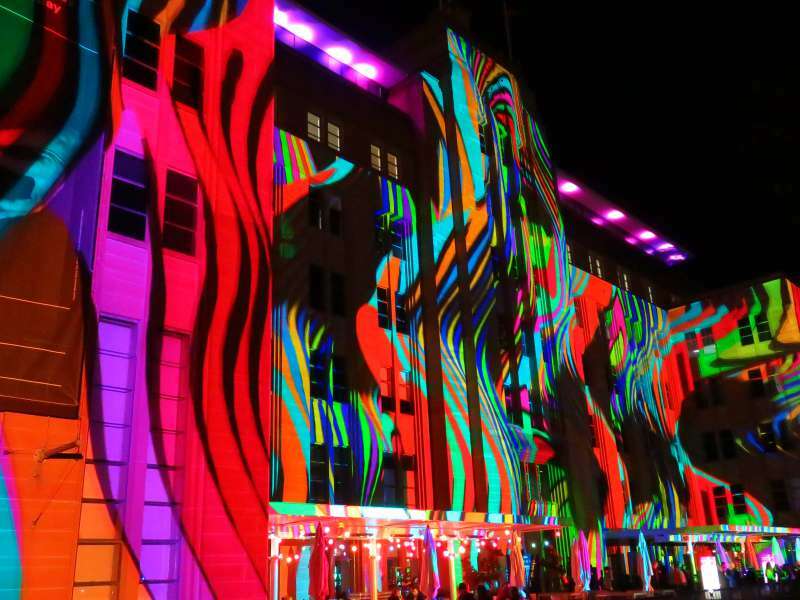 Perth needs to copy us and hold its own Vivid. There are some stunning spots for it in the CBD - near where the giant paperclip thing is. The pictures of Vivid are always amazing. I will get there one of these years (something just always seems to come up). Thanks for the photos to keep me from forgetting to schedule this event. Let me know if you ever decide to come. We can all have dinner together at one of the Circular Quay restaurants and watch the patterns on the Opera House. I've never heard of this light and music festival, but I haven't been to Australia either, so no wonder. I'm sure it must be quite an experience being there during the festival. All those ferric lights... I'd love to see it but it's in winter and if I were to come to Sydney I would rather come in summer. It must be cold right now. Thanks for joining #TheWeeklyPostcard. It is cold. David whinges endlessly about Vivid being on in winter but I think the idea was probably to draw tourists here during a quiet time of year. I wouldn't enjoy it as much in summer because it would have to start too late - it needs to be dark. 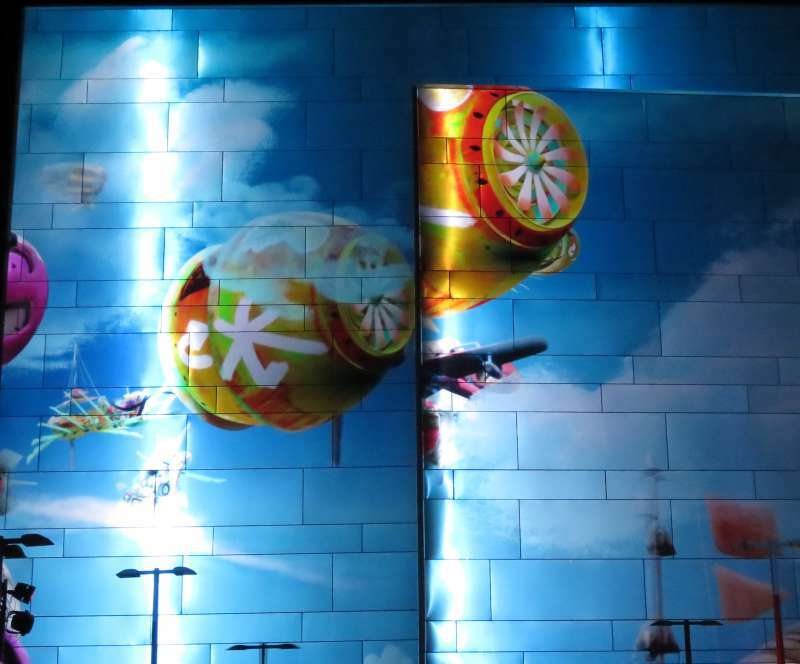 Lots of people in the Sydney Travel Bloggers group are writing about Vivid right now. The photo opportunities are just too good to pass up. It looks stunning in real life, although sometimes I think it looks even better in photos. So many people have such great talent at capturing the light. You will have to come to Sydney one day. Vivid is on every year. Since our visit there, now several years ago, I've had a desire to return and this festival would certainly be a good time to do so! Beautiful photos and great tips! 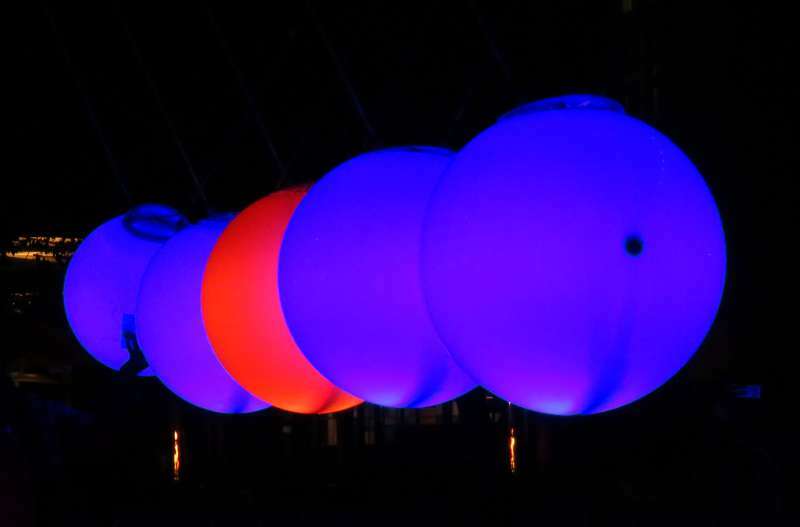 The weather can be a bit chilly during Vivid. It is a stunning festival but not necessarily the best time of year otherwise. Sydney gets lots of beautiful, sunny winter days but as I type this it is grey, overcast and raining and the forecast for the next few days is the same. I'm so sad I'm missing Vivid this year, but hey I do get to be home in Auckland :). I saw the harbour bridge all lit up on my flight from Adelaide to Sydney. I hate missing Vivid but David loves to travel at this time of year. What was it like from the air? This post is pure eye candy! I love the first one of the Sydney Opera House! Thx for sharing. I think that first Opera House photo is probably my favourite. It was stunning to see in real life. I know how your friend feels. I resisted going to Vivid for years. It is on during winter and I don't like either the cold or the dark. I figured - how interesting could a few lights on buildings be? Then I went one year when I had to be in town anyway and I was hooked. Now I try to go every year. You just can't describe how stunning Vivid is. 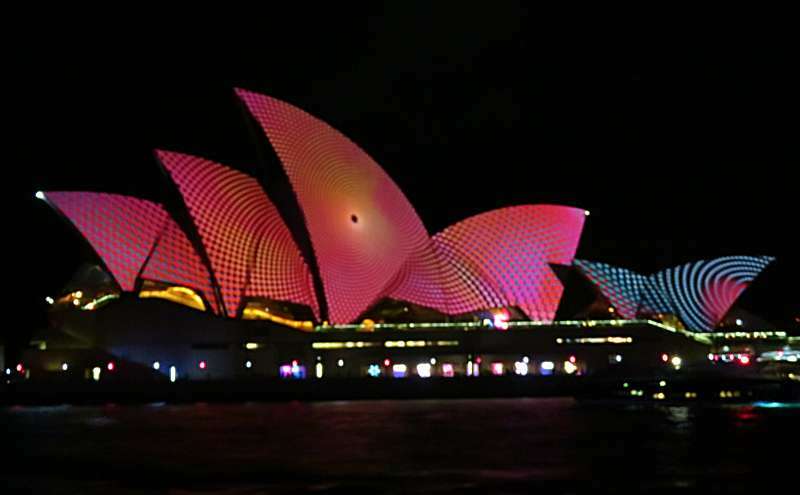 Those iconic Vivid Sydney shots are how I came to know the place as a guy living in the US for much of his life; especially those nighttime shots of the Opera House. Loved the snaps here! The Sydney Opera House has to be one of the most photogenic buildings in the world. I am glad you like my photos.